Instead of being analogous to the power of declaring war (the president’s power as commander in chief) affords a striking illustration of the incompatibility of the two powers in the same hand. Those who are to conduct a war cannot, in the nature of things, be proper or safe judges, whether a war ought to be commenced, continued or concluded. They are barred from the latter functions by a great principle in free government, analogous to that which separates the sword from the purse, or the power of executing from the power of enacting laws. I was please to facilitate, and to sign, an ad that ran on the op-ed page of the New York Times last month. It denounced the smear of anti-Semitism used on war opponents, and noted that “America can only be harmed by this war. Our kids killed, our liberties suppressed, our taxes raised, the government engorged, the recession deepened, our constitution shredded.” It urged those “salivating for war” to “buy rifles and parachute into Baghdad. But not to kill our soldiers and wreck our economy.” The promoters of the war want a “New World Order,” said the ad. We believe in the “old American republic.” Co-chairman of the new group are Burt Blumert of the Center for Libertarian Studies and Lew Rockwell of the Mises Institute. Other signers included: Professor Richard M. Ebeling of Hillsdale College, Professor Paul Gottfried of Elizabethtown College, Professor Edward Kaplan of Western Washington University, Dr. Gary North of Remnant Review, entrepreneur James Rodney, and Professor Murray N. Rothbard of the University of Nevada, Las Vegas. The committee has a small deficit. To help, and to join, send dues of $50 to JCAMW, PO Box 2802, Auburn, AL 36830. David Duke received 44% of the vote in the Senate primary race. In Louisiana, 60% of the white vote, and 9% of the black vote! This totaled 100,000 more votes than the current governor when he won. Duke lost the election, but he scared the blazes out of the Establishment. If the official Republican hadn’t been ordered to drop out, he might have won. Certainly there would have been a run-off. To many voters, this seems like just plain good sense. Duke carried baggage from his past, but the voters were willing to overlook that. And if he had been afforded the forgiveness an ex-communist gets, he might have won. 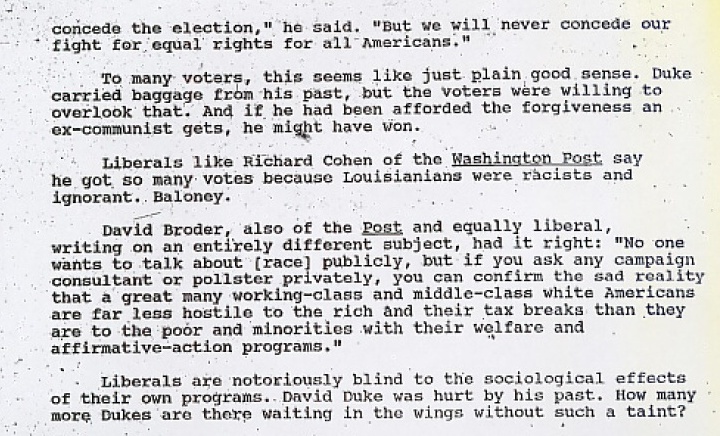 Liberals like Richard Cohen of the Washington Post say he got so many votes because Louisianians were racists and ignorant. Baloney. Liberals are notoriously blind to the sociological effects of their own programs. David Duke was hurt by this past. How many more Dukes are there waiting in the wings without such a taint? On September 1, a federal data bank for tracking physicians, dentists, and other health-care professionals began operating at a cost of $16 billion. It will accumulate data on 50,000 providers in the first year. When a doctor is sued, his name is put on a blacklist. Since 80% of the OB-GYN doctors are sued, many innocent physicians will be blacklisted wrongly. This program is designed to monitor physicians, but it will spread to all professions and businesses. If it is right for physicians, why not for attorneys, business people, and everyone else? Liberal Senator Barbara Mikulski (D-MD) recently pointed out that Jack Kemp’s 27-person public affairs office is spending its time on Kemp’s next campaign instead of HUD. Mikulski, chairman of the appropriations subcommittee that oversees HUD, deleted the funding to cries of anguish from Kemp. Undoubtedly it will be restored, but I still enjoyed the whole thing. This document is now on scribd, in two parts: “Ron Paul Newsletter November 1990 Page 3” and “Ron Paul Newsletter November 1990 Page 4”. A scan of this newsletter can be found at @RP_Newsletter, “November 1990: The Ron Paul Political Report”. On August 19th, 2014 the link to this report was changed from a defunct one at the New Republic to scans at the blog @RP_Newsletter. On August 20th, a link was added to an upload of the document on scribd.